Among the Peredvizhniki (organisers of mo­bile exhibitions) (The Peredvizhniki is discussed in detail in article about I.N. 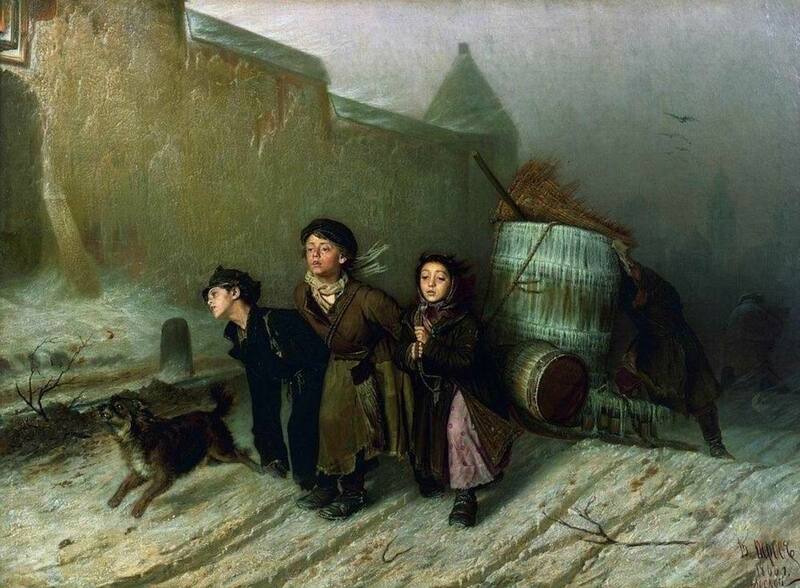 Kramskoi) who devoted their talent to the ‘muse of wrath and sorrow’, a special place was occupied by Vasily Perov. Perov was born in Tobolsk, the illegitimate son of the public prosecutor G. K. Kridener—an enlightened, free-thinking man who received exiled Decembrists in his home. The boy showed a love for art at a very early age. Having received a rudimentary education from his mother, and then from the reader at the local church, in 1846 the young Perov entered A. V. Stupin’s art school in Arzamas, after which he continued his education at the Mos­cow School of Painting and Sculpture. The young artist’s world-outlook was influenced by many things — by mixing with other pupils, who came from all over, by his close friendship with the artists I. M. Pryanishnikov and I. I. Shishkin, by his classes with teachers who con­tinued the traditions of Venetsianov, and by his love of literature, especially Nekrasov, Turgenev and Tolstoy. His years of study were hard ones: he had nowhere to live and no money. He almost gave up the School and left Moscow, but then his fate took a happier turn. Upon hearing of the young student’s impecuniosity, one of the teachers at the School, Ye. Ya. Vasiliev, decided to put him up in his own flat. In 1856 Perov had his first success: for the drawing Head of a Boy he received a second- class silver medal, and for the picture The Poli­ce-Officer’s Arrival at the Inquest (1857, Tretyakov Gallery, Moscow) he was awarded a first-class silver medal. From the outset of his career, the artist kept firmly to genre painting, continuing the traditions of democratic realism begun by Pavel Fedotov. In 1861, already an accomplished master of genre painting, Perov graduated from the School, receiving a first-class gold medal for the painting which brought him fame—Sermon in the Village (Tretyakov Gallery, Moscow). This early work clearly exhi­bits what were to become the artist’s distin­guishing marks—a sharp satirical flavour and apt characterisation, clear composition and gentle, muted colours. In 1862 Perov painted another canvas—Tea-Drinking at Mytishchi (Tretyakov Gallery, Moscow)—in the same anti­clerical mould as the earlier works. Here he sharply criticised social inequality and exposed the hypocrisy and parasitism of the clergy. The work was occasioned by the artist’s personal impressions from a trip to the town of Myti­shchi, where he observed such scenes more than once. In January 1862 Perov was sent abroad at the expense of the Academy of Arts. He visited ma­ny museums in Berlin, Dresden and Paris and studied the works of the old masters. He also spent a great deal of time in the poor quarters of Paris, attended popular festivities and fairs and strolled in the environs of the city. 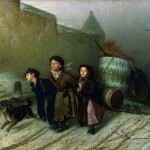 The paintings executed at this time illustrate the everyday life of the lower classes in Paris, street musicians, beggars, ragmen and simple Parisians. They include The Blind Musician (1863, Tretyakov Gallery, Moscow), A Sa­voyard (1863-64, Tretyakov Gallery, Moscow), Parisian Fete (1863, Tretyakov Gallery, Moscow) and Street Scene in Paris (1863, Tretyakov Gallery, Moscow). Perov was given permission to return home. He was deeply affected by his fresh encounter with Russian reality and with the poverty and misery that reigned in Russia after the notorious ‘emancipation’ of the serfs. The main motif of his work now became sympathy with the bitter lot of the working people. But the orientation of his works remained the same, and they lost none of their former denunciatory power and public­spiritedness. Among the best works from this period were Funeral Procession (1865, Tretyakov Gallery, Moscow), Troika (1866, Tretyakov Gallery, Moscow), The Drowned Woman (1867, Tretyakov Gallery, Moscow) and At the Last Inn (1868, Tretyakov Gallery, Moscow). All of them stand out because of their depth of content, vivid imagery and emotional power. One of the most moving of these works is Fu­neral Procession. Head down, a little horse is drawing a sled with a wooden coffin, covered with bast matting, over a winter field. The dead man—husband, father, breadwinner—is accompanied on his last journey by his family. As the critic Vladimir Stasov wrote, ‘Coldness, wasteland, backwoods besprinkled with snow, oblivion and eternal obscurity: any one of a mil­lion little birds may as well have frozen on the road, unknown to anybody, and with nobody interested in its life or in its death—such is the content of this picture.’ From the concrete situa­tion portrayed Perov managed to rise to a uni­versal image of the grim fate of the Russian peas­ant. There is nothing superfluous in the paint­ing: the composition is well thought-out and the rhythmical repetition of the lines are of great importance, lending the picture a lament-like quality. The dismal winter landscape and the low, grey, leaden sky intensify the mood of for­lornness that suffuses the scene. Funeral Proces­sion has always been one of the most popular works of this ‘poet of sorrow’, as the artist M. V. Nesterov called Perov. Perov achieved even greater emotional po­wer and artistic laconicism in At the Last Inn—a work suffused with profound grief and solitude. The mood is created above all by the landscape. Somewhere on the horizon, where the road dis­appears, glows a yellow strip of diminishing win­ter twilight. Sombrely silhouetted against it are the stone towers of the town gates, crowned with double-headed eagles. In no other work did Perov attain such expressive colouring and such broad, free brushwork. In Troika Perov spoke out against the in­human exploitation of child labour in a ca­pitalist town, against the social injustice that doomed children to a hungry and beggarly exis­tence. The theme of the city is heard even more loudly in The Drowned Woman. 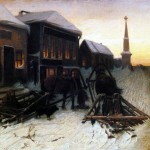 Perov him­self witnessed the tragedy depicted here. In his original study for the painting the artist pain­stakingly recorded all that he saw—a crowd of people, a policeman asking those present whether they recognise the unknown woman. In the final version only two figures remain — the body of the drowned woman and the policeman, who is indifferent to everything. A cold, light mist is rising from the river, and through the haze can be seen the silhouette of the Moscow Kremlin; it is quiet, early morning. The poetry of nature awakening makes even more poignant the tragedy of a life cut off too early. In the painting entitled The Arrival of a Governess at a Merchant’s Home (1866, Tretyakov Gallery, Moscow) Perov turned to the fate of women. We see a governess, a modest, intelligent girl, timidly and embarrassedly presenting herself to the mer­chant’s family, who brazenly and unceremo­niously look her up and down. In his powerful characterisation of merchant-class figures and in his cutting satire, Perov is akin to the drama­tist Ostrovsky, who also exposed the oppressive world of the merchant class. In Perov’s works of the second half of the nineteenth century, according to Stasov, Rus­sian art emerged ‘in all the grandeur of its real role: it portrayed life, it “explained” it, and it passed sentence on it’. In 1869 inMoscow, Perov got together with the group of artists who subsequently founded the Society of Peredvizhniki. In 1871 the Society’s first exhibition opened in St. Peters­burg, and its exhibits included Perov’s The Hunters Take a Break, The Angler and his portraits of Alexander Ostrovsky and Ye. Timasheva. From this time on the artist’s life was bound up with the Society, and for seven years he was member of its board. Also at this time, he began teaching at the Moscow School of Painting and Sculpture, and tried his hand at writing. He wrote several stories, such as ‘Aunt Maria’; ‘Under the Cross’; ‘In Real Life; Fanny under No. 30’ and others, in which he told the story of how many of his pictures were created. In the seventies Perov produced fewer and fewer works with a social message. Instead, the accent moved on to gently humorous genre paintings showing characteristic scenes from Russian provincial life. The Fowler (1870, Tretyakov Gallery, Moscow), The Angler (1871, Tretyakov Gallery, Moscow), The Hunters Take a Break (1871, Tretyakov Gallery, Moscow) and The Botanist (1874, Tretyakov Gallery, Moscow) all fall into this category. The interest in man which was always present in Perov’s art found its deepest expression in the portraits of his contemporaries. In the main, these were portraits of peasants. The artist was attracted by people with vivid personalities and a rich inner world. Gloomy Fomushka (1868, Tretyakov Gallery, Moscow) is a peasant who has clearly had a hard life, full of drudgery and humiliation, but he has retained his human dignity. Even more penet­rating in its psychology is the portrait of The Wanderer (1870, Tretyakov Gallery, Moscow). Perov’s portraits of eminent cultural figures, painted in the early seventies, bear comparison with the best works of Kramskoi and Repin. Pe­rov’s portraits are remarkably simple, sincere and realistic; they are natural in composition and austere and sparing of colour. The play­wright Alexander Ostrovsky (1871, Tretyakov Gallery, Moscow) is portrayed in a simple domestic surrounding. The portraits of the doctor V. V. Bessonov (1869, Tretyakov Gallery, Moscow), the poet Apollon Maikov (1872, Tretyakov Gallery, Moscow), the writer Ivan Turgenev (1872, Tretyakov Gallery, Moscow) and the lexicographer Vladimir Dal (1872, Tretyakov Gallery, Moscow) are all painted with extreme delicacy and sincerity. 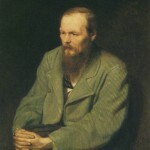 But the finest of all his portraits is undoubtedly that of Fyodor Dostoyevsky (1872, Tretyakov Gallery, Moscow). His bent back and head drawn into his shoulders and his large, strong, nervous hands clasped around his knees bespeak a man who has known much suffering but has preserved great inner strength. The writer’s head is wonderfully drawn—especially the sensitive, emaciated, pale face with its high brow and sharp, dark eyes. The expressiveness of the portrait is aided by the greyish-brown colour range, relieved only by the red flecks on his black tie. ‘This portrait is not only Perov’s best, but one of the best in the whole of Russian painting,’ wrote Kramskoi. Some of Perov’s portraits are sharp and satiri­cal. As an artist of great integrity, he remained truthful even when carrying out official commis­sions. In his portrait of the merchant I. S. Kamy­nin (1872, Tretyakov Gallery, Moscow), for example, he could not help expressing his own attitude to this typical representative of the ‘realm of darkness’: the vi­vid individual image is used to reveal social fea­tures characteristic of the merchant class as a whole. In the last years of his life Perov worked prolitically, and turned to a new genre—historical painting. He planned a trilogy about the Puga­chov rebellion, but only managed to complete several studies for the last part of the trilogy —The Judgment of Pugachov (1879, RUSSIAN MUSEUM, Saint Petersburg). Other of his plans also remained in the draft stage—for example The Siege of Pskov (1879), Pimen and Grigory (1879), Mikhail Tverskoi in the Tatar Horde (1876) and The Torture of Boyarynya Morozova. The artist’s last work was the large, many-figured painting Nikita Pustosvyat (1881, Tretyakov Gallery, Moscow). 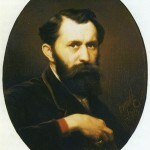 Vasily Perov was only 48 when he died, on 10 June 1882. His importance in the history of Russian painting is enormous. He had some­thing new to say in many genres, but his real vocation was genre painting, to which he de­voted all his talent and the best years of his life. In this genre he took up social problems of inestimable importance, expressing the most progressive ideas of the time. Cvv shop online: login valid shop online buy fresh credit cards cvv 2card.su.